What that also means is that meteorites are made of very old materials. Nakhlites are made of 1-billion-year-old magma, providing clues about geologic activity on a younger Mars. 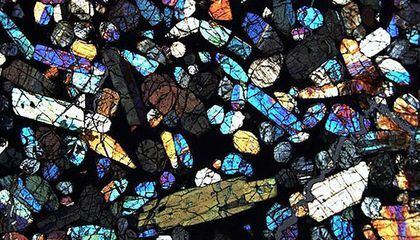 Some meteorites can be traced back even further, to a dynamic period about 3.9 billion years ago called the Late Heavy Bombardment. The Earth, its Moon (look at all the craters!) and other planets were bombarded with meteorites for reasons that scientists are still trying to understand. Learn more about collisions in space and meteorites from Mars in a live "Smithsonian Science How" webcast on Thursday, June 9, 2016. In Exploring the Solar System with Antarctic Meteorites (11 a.m. and 2 p.m. EDT on the Q?rius website), meteoriticist Dr. Cari Corrigan will show you some meteorites that are kept in collections at the National Museum of Natural History, while answering your questions live. Get teaching resources to use with the webcast. Cold and dry conditions are best for preservation because of the very cold temperatures way of making objects freeze and maintain it's original state;"The intense, Antarctic winds erode the ice surface away. That leaves meteorites exposed." I chose this article because I am fascinated with space and things that come from it. Cold and dry conditions are best preservation because, "Although meteorites fall all over the Earth, the cold, dry conditions of the South Pole are ideal for preserving them. The movements of ice sheets concentrate the meteorites against mountainsides. The intense, Antarctic winds erode the ice surface away. That leaves meteorites exposed." The cold conditions will allow the meteorites to not decay or erode and they will only erode the surrounding materials. I think that it is very interesting that these scientists were able to discover such important evidence from mars. Cold and Dry are ideal for preservation because "Although meteorites fall all over the Earth, the cold, dry conditions of the South Pole are ideal for preserving them. The movements of ice sheets concentrate the meteorites against mountainsides. The intense, Antarctic winds erode the ice surface away. That leaves meteorites exposed." The very cold area wont allow for the subject to erode or decay. This article was interesting to me because i love when i see a flying star. They are best for preservation because the very cold temperatures make objects freeze which enables the object to maintain it's original state. The article says, "...the cold, dry conditions of the South Pole are ideal for preserving them. The movements of ice sheets concentrate the meteorites against mountainsides." This shows that the cold and dry conditions are ideal for preservation. I was interested in this article because I like to learn about things that come from space. I was surprised by this article because I didn't know you could preserve something for that long. The Antarctic meteorites had been preserved for billions of years which made it easier to find meteorites that had been preserved by the cold, dry conditions that can be able to become preserved for billions of years. Some meteorites might have came down from Mars in which scientists would be able to study more about the meteorites by seeing the particles inside the meteorites that had fallen from Mars. 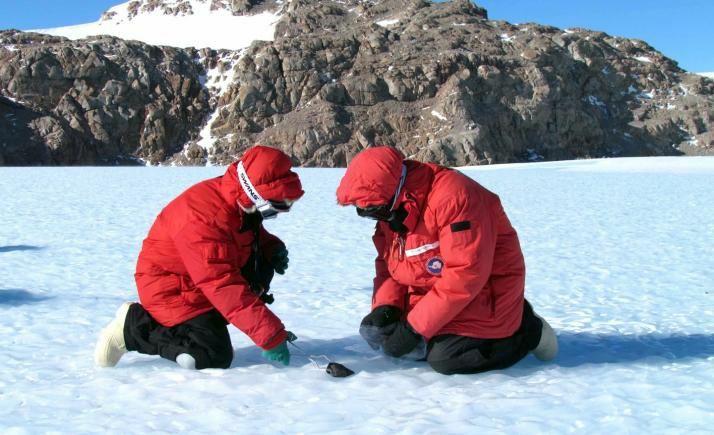 The preserved meteorites had made it easier to find meteorites on Antarctica after a lot of meteorites had been preserved from the cold, dry conditions on Antarctica. Critical Thinking Question: Why are cold, dry conditions best for preservation? Answer: I know that cold, dry conditions are best for preservation because the windy weather on Antarctica can expose the meteorites and become preserved for billions of years after it came down on earth. Cold, dry conditions are best for preservation because it is ideal. In the first paragraph, the article sates that, "Although meteorites fall all over the Earth, the cold, dry conditions of the South Pole are ideal for preserving them. The movements of ice sheets concentrate the meteorites against mountainsides. The intense, Antarctic winds erode the ice surface away. That leaves meteorites exposed." Therefore, cold, dry conditions are best for preservation because it is more ideal. I liked this article because I learnt something new, however I thought it was relatively unnecessary for me to need to know. Cold, dry conditions are best for preservation because "the movements of ice sheets concentrate the meteorites against mountainsides. The intense, Antarctic winds erode the ice surface away. That leaves meteorites exposed." I found this article interesting because I am interested in space and Antarctica. Scientists will get a lot of clue about the meteorites if they fall on Antarctica and get preserved there. The meteorites can contain a bunch of old material from other places like Mars which can give scientists geological evidence of a place. I think that cold, dry conditions are best for preservation because the material can freeze and it won't have any stains or effects on it like water. Cold, dry conditions are best for preservation for many different natural reasons. At the article's beginning, it is stated that, "The movements of ice sheets concentrate the meteorites against mountainsides. The intense, Antarctic winds erode the ice surface away. That leaves meteorites exposed" (paragraph 1). Due to as multitude of factors such as ice sheets traveling and high winds, antarctic weather patterns are ideal for the preservation of meteorites. The climate of Antarctica is perfect for the maintaining of meteorites because of its cold, dry conditions. I found this article interesting because, in science class, we just finished learning about space, and along with space, meteorites. However, we did not learn that Antarctica was possibly the best place on Earth for them to land (in order to be studied)! Cold, dry conditions are best for preservation of meteorites because the conditions are more ideal than other places in the world. "The cold, dry conditions of the South Pole are ideal for preserving them. The movements of ice sheets concentrate the meteorites against mountainsides. The intense, Antarctic winds erode the ice surface away. That leaves meteorites exposed." I liked this article and found the picture to be very pretty.